Drs. Jeffrey Stutman and William Stutman are graduates of University of Detroit School of Dentistry. With combined dental experience of over 40 years, they are pleased to offer you comfortable and confident dental service. The doctors are members of American Dental Association, Michigan Dental Association, International Association for Orthodontics, Academy of General Dentistry, American Academy of Cosmetic Dentistry. Dental implants enable dentists to create healthy, attractive smiles in an innovative way. Used to replace one or more missing teeth, implants are another alternative to conventional bridges and dentures. In essence, dental implants act and look like natural teeth. And, because they maintain bone mass, dental implants can help prevent additional tooth loss as well as the sunken facial appearance associated with missing teeth. A dental implant restoration consists of a bio-compatible titanium screw and post topped by a crown bridge or denture. The implant is surgically replaced into the jawbone where it replaces the natural tooth root. In a few months, the implant securely attaches to the bone (called "osseointegration"), allowing it to withstand biting and chewing forces just like a healthy, natural tooth. Replacement of one or more missing teeth. Support of a non-removable "bridge" to replace multiple teeth. 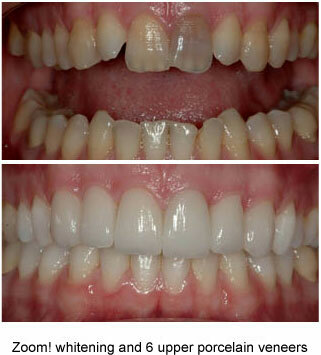 Patients who successfully pass a screening and evaluation can be considered as candidates for implant replacement. The primary limiting factor inherent in implant therapy is the amount of bone available to receive and support the implant. If it's determined that a patient does not have enough bone to support an implant restoration, bone grafting procedures may be considered. Heavy smoking and some medical conditions may preclude the use of implant therapy. To determine the appropriate site for the implant replacement, dentists typically take x-rays. Some may prescribe CT scans as well. 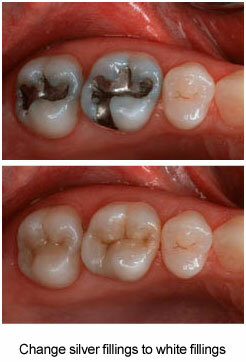 Impressions are taken of the mouth and then used by the dental laboratory to create a customized restoration. Many dentists fabricate surgical guides to simplify the placement of implants. What Happens At The Second Appointment? At the second surgical appointment, the dentist makes an incision to expose the bone at the implant site. The dentist then prepares the sire to receive the implant. Once the implant is secured, the gum tissue is sutured back over the implant. The implant is left undisturbed for three to six months to allow it to osseointegrate with the bone. If the implant is in a visible area of the mouth, the patient may choose to wear a temporary prosthesis during the healing period. Dentures may be relined with soft liners to allow patients to comfortably wear them during the healing process. What Happens At Subsequent appointments? Once the implant has been completely integrated with the bone, a post is attached to the implant. The dentist then creates the permanent tooth replacementEnter a detailed description of your product or service. You can add as much text as you like, and even add images to illustrate your offering. Tell your visitors why they should buy from you! Add a new section for each product or service. Preventive measures can do wonders for your dental health. A few simple homecare practices, paired with regular visits to your dental professional will go a long way toward maintaining optimal oral health. Daily preventive procedures share the common goal of removing bacteria from the mouth. If allowed to build-up, bacteria adheres to the teeth, tongue and soft tissue which becomes plaque, that over time can mineralize into a hard substance called calculus. Only professional cleanings can remove calculus. Inadequate plaque control is the primary cause of gingivitis (inflamed gums), periodontitis (bacteria gum disease), and oral malodor (bad breath). Patients can minimize bacterial accumulation through regular brushing, flossing, and tongue scraping, and periodic dental hygiene appointments (dental prophylaxis). Professional cleanings and assessments enable dental professionals to remain abreast of your oral health status and they can provide guidance on steps to take to maintain healthy teeth and gums. Regular preventive dental visits allow problems to be identified early while they can be fixed easily and painlessly. Fluoride therapy has been proven beneficial in maintaining optimal oral health, particularly in the prevention of tooth decay and hypersensitivity. Since the introduction of fluoride into public water supplies more than 50 years ago, the incidence of cavities has declined dramatically by strengthening developing permanent teeth. However, professional fluoride treatments, combined with daily home therapy, can often times improve dental health. Treatment options vary according to a patient's susceptibility to decay, level of tooth sensitivity, periodontal (gum) condition and number of cosmetic restoration. A professional fluoride treatment is an important part of your dental cleaning. The fluoride treatment will enhance the ability of your tooth surface to resist acid attacks and decay and replace the layer that is removed during tooth scaling and polishing. If you've ever had a questionable area of decay, tooth sensitivity, or bleeding gums within the last year, a professional take-home fluoride may be necessary. Your dental professional will recommend the most appropriate fluoride based on your oral condition. Daily fluoride therapy may also be helpful for patients with orthodontic appliances, or those with exposed rot surfaces. Like fluoride, dental sealants can give today's children a head start on good oral health. A sealant is a clear acrylic material that is applied directly to cavity-prone chewing surfaces and grooves of the back teeth, providing protection against decay. Sealants are most beneficial when applied to the permanent teeth as soon as they grow in. The sealant is simply placed on the teeth, and a special light is aimed at the area to harden the material so that it adheres. It is important to note that sealants do not eliminate the need for daily home care. Children still should be taught to brush with a fluoride toothpaste and floss.Enter a detailed description of your product or service. You can add as much text as you like, and even add images to illustrate your offering. Tell your visitors why they should buy from you! Add a new section for each product or service.